This is City’s third title in seven seasons and easily its most convincing, with Pep Guardiola’s team 16 points clear and still having five games to play this season. 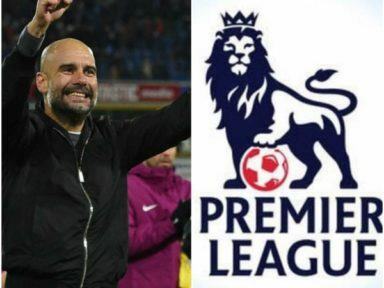 Manchester City Coach, Pep Guardiola has now added the English Premier League title to his previous domestic successes in both. Germany, as the English club has officially been crowned Premier League champions. Without even playing on Sunday, Manchester City won the English Premier League after their nearest challenger Manchester United were shocked with a 1-0 loss at home, to bottom-placed West Bromwich Albion. “We’ve won you the league, Manchester City, we’ve won you the league,” sang West Brom’s fans near the end of the game. By completing the job after 33 games, City have emulated the achievement of United, who also secured the crown with five matches to spare in 2001.